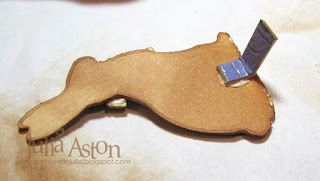 For the A Vintage Journey March Challenge (March also happens to be AVJ's Birthday!) 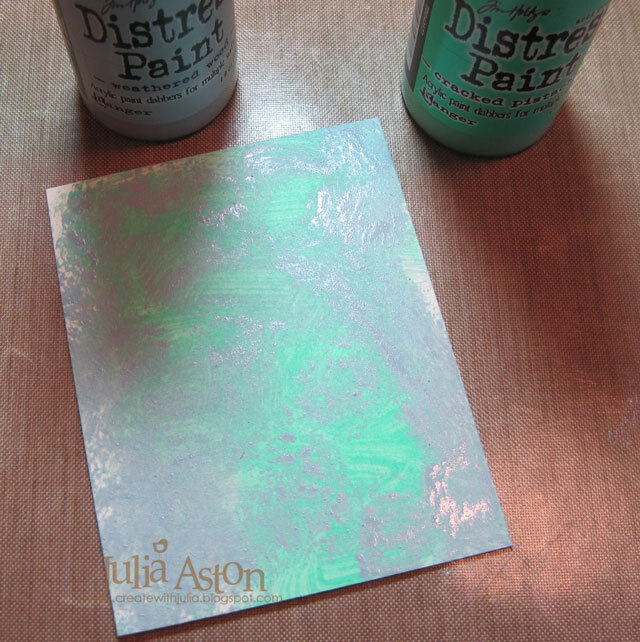 - Nikki is challenging us to use the contents of the March Design Inspiration Travel bag. Here is Nikki's description: For our birthday challenge we thought it would be fun to challenge you to use the products in our DI Travel Bag this month. You’ve seen how the Creative Guides have used the products in the past and you will see how they use them this month too. So join us in using the following products and enjoy the journey! So here are the contents of our travel bag - the supplies we have to use for our project. 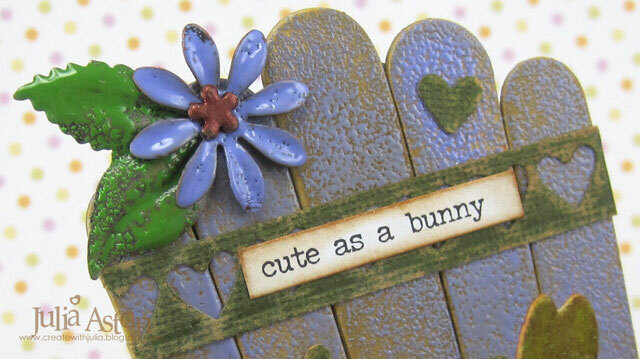 When I looked at the supply list - the substrate made me think I might make something 3D using matboard and the color lilac made me think Easter (which is early, the last Sunday in March, this year!) and so here is what I created. I used Eileen Hull's Chair - 3D Adirondack Sizzix Die. I have several photos to share of just how I put this together - and how I used the contents in our travel bag. 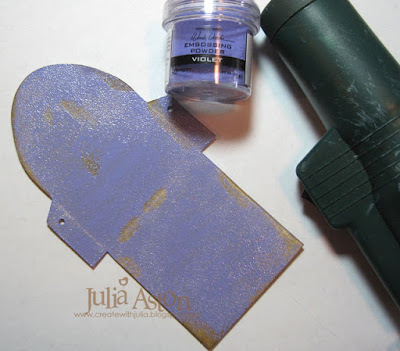 Then I quickly dumped WV Violet Embossing powder over the piece and embossed it with my heat tool. I did that on the front and back of each piece - then sponged all the edges and bends with Ranger Distress Vintage Photo Ink. 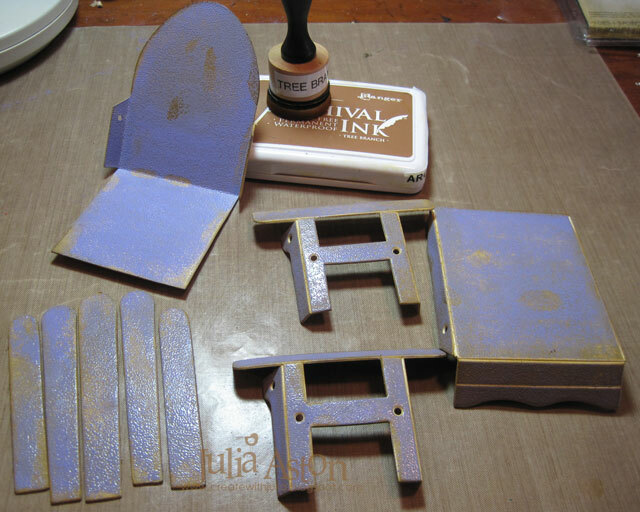 The powder doesn't stick everywhere when you emboss like this which gives it a great distressed/vintage look. 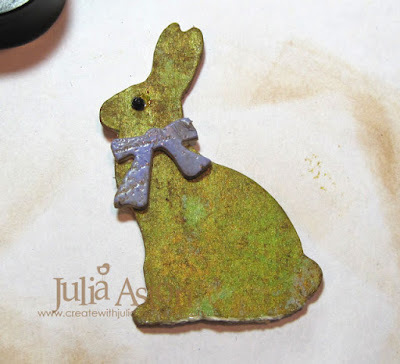 To get the Technique: Rust Effects into my project - I used Tim's Eroded Metallic Technique found on page 44 of Vol III Compendium of Curiosities for my die cut bunny. 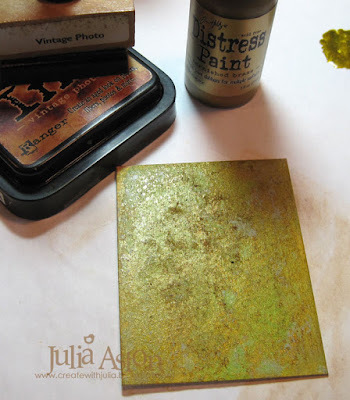 First, I rubbed two Distress Paints over a piece of matboard - Weathered Wood and Cracked Pistachio, and dried it with my heat tool. 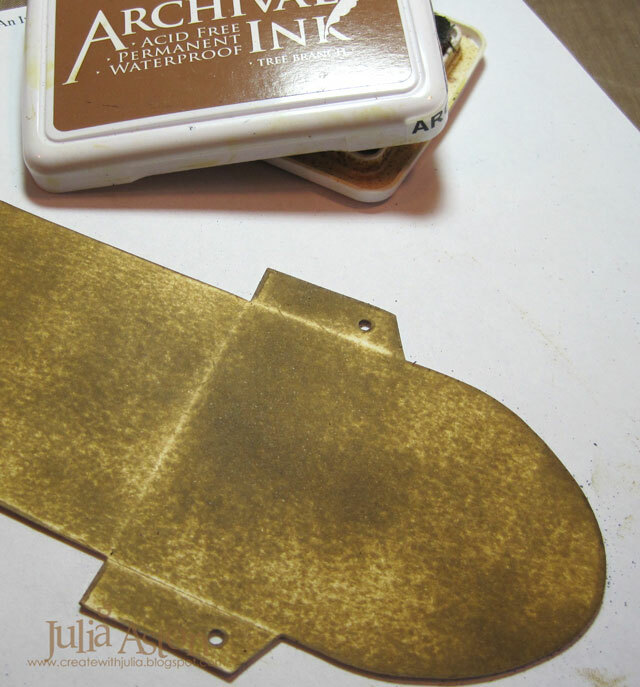 Then I rubbed Tarnished Brass Distress Paint completely covering the panel. I spritzed it with water, immediately pressed a paper towel over the panel to absorb the water and some of the paint, and quickly removed the towel. Then I sponged Vintage Photo Distress Ink over the whole panel. I die cut the bunny (Movers and Shapers Mini Bunny and Bow Set) out of the panel, adding the die cut bow that I had embossed in the same purple as the chair, and a black rhinestone eye. 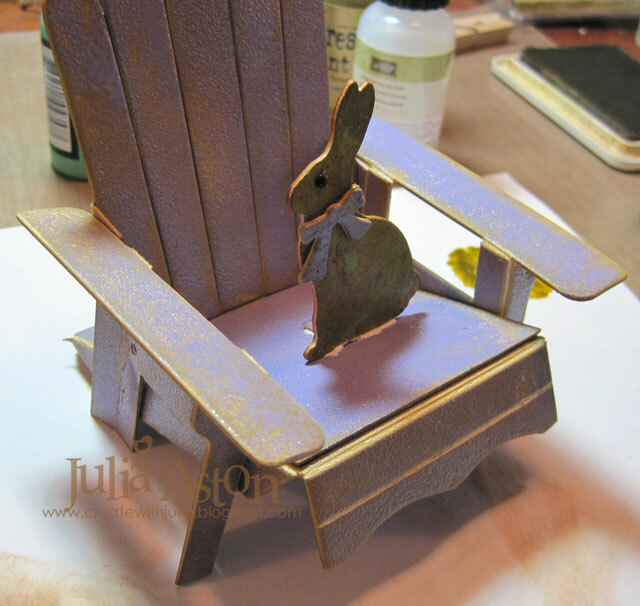 I added a little tab to the back of the bunny so I could adhere her to the center of the chair. here she is - sitting up pretty as you please! 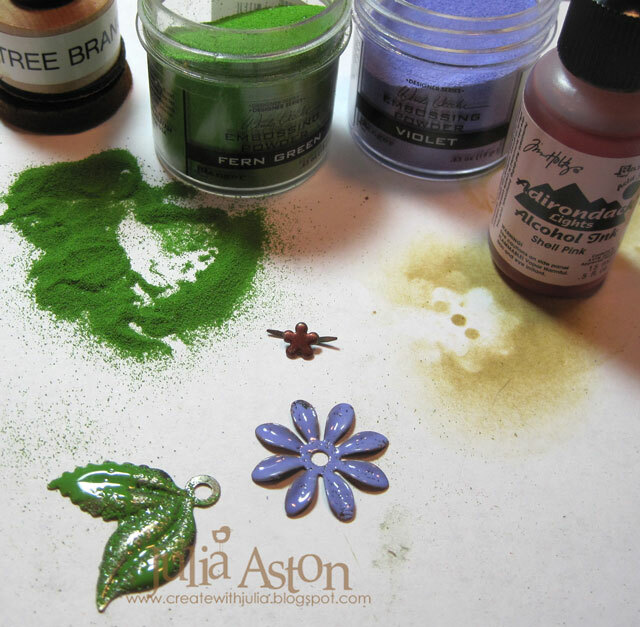 To get the Product: something metal piece into my project - I embossed a flower and leaf stem from Foliage by sponging them with WV Archival Tree Branch Ink and covering them with WV Fern Green and Violet Embossing Powders - again there is an uneven coverage which gives them a nice vintage look (although you can keep adding powder until it is solidly covered with color). I dropped some Shell Pink Adirondack Ink onto the flower brad that I used to hold the flower and stem together and to attach them to the chair. I punched a hole in the chair back with my Cropadile to add the flower. To finish off the decoration of my Easter Adirondack Bunny Chair - I die cut a row of hearts using the Thinlits Shape Strips out of Kraft Core Cordinations green paper. I sanded over the paper to reveal some of the kraft core. I added the strips layered with Small Talk/Occasion stickers across the back of the chair and across the bottom of the chair. 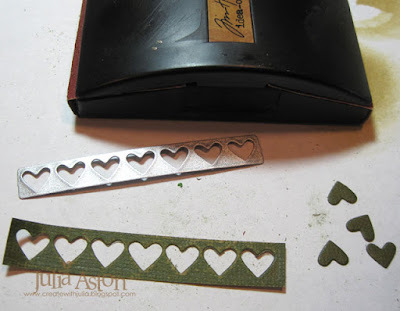 I also adhered 3 of the cut out hearts on the back slats of the chair. 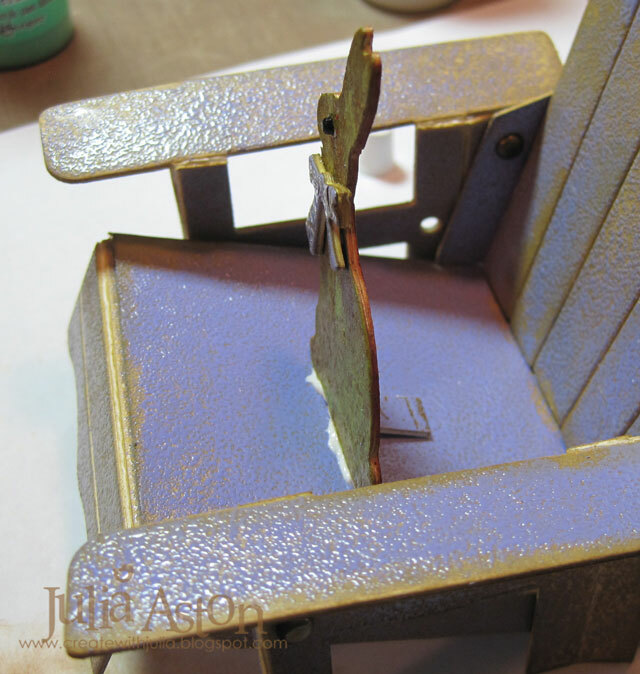 I wasn't sure whether I needed to emboss both sides of each piece when I started making my chair - but I'm glad that I did - as it looks nice and 'finished' no matter what angle you look at it from! I laid some brown basket filler around the bunny and will also add some candy eggs. at the A Vintage Journey Blog. Paper: Sizzlets Cream Matboard - Sizzix, Kraft Core Coredinations Green Paper. Ink: Wendy Vecchi Archival Tree Branch, Ranger Distress Vintage Photo. 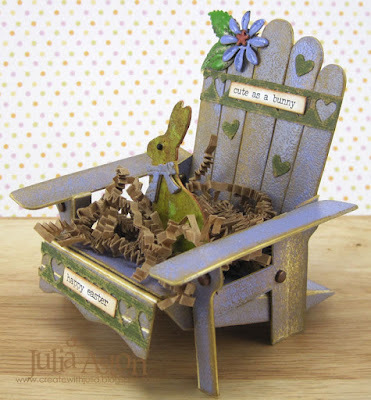 Accessories: Dies: Chair - 3D Adirondack - Eileen Hull/Sizzix, Movers and Shapers Mini Bunny and Bow Set - Tim Holtz/Alterations, Thinlits Shape Strips - Alterations/Tim Holtz, Idea-ology - Foliage, Small Talk/Occasions, Tiny Twinkles - Taylored Expressions, mini sander - Ranger, Scotch Quick Dry Adhesive, Wendy Vecchi Embossing Powder - Violet and Fern Green, Ranger Distress Paints - Weathered Wood, Cracked Pistachio, Tarnished Brass, flower brad - Making Memories. This is so cute and so clever! 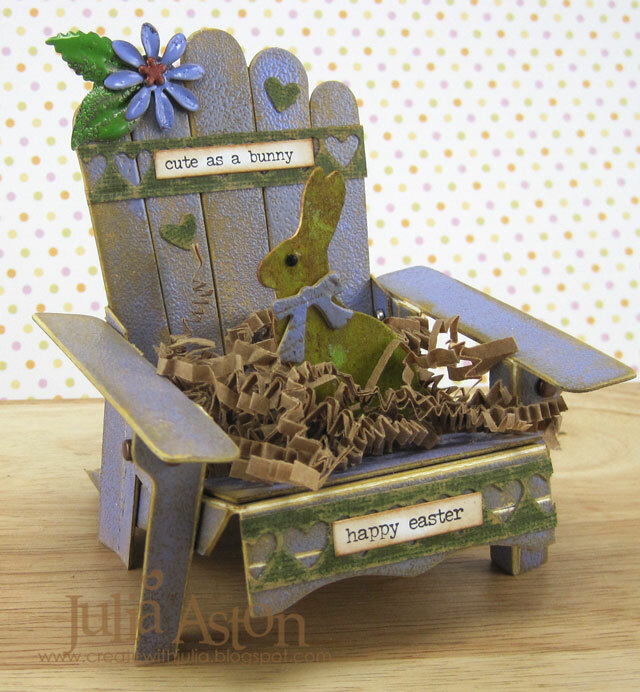 Wow Julia, your Easter chair composition is absolutely awesome! I love it! 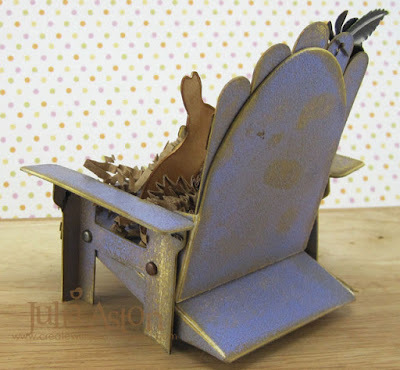 My favourite is the embossed vintage look chair! Love this very unique project Julia especially the cute bunny on it. Very cleverly put together. What a wonderful 3D project! Julia - so original. Love the vintage look you've achieved with the various techniques . A really inspirational way to use the contents of the travel bag . 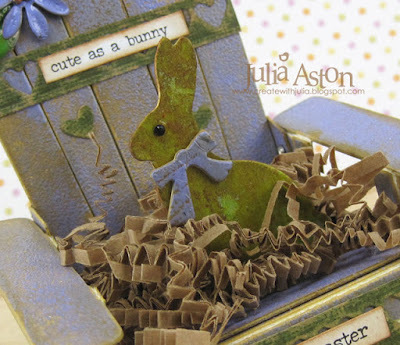 What a super clever piece of Easter crafting Julia, totally brilliant and so cleverly put together. I adore all the little details that make it special! Fabulous project! how cool is this!!!! wow! Super fun project Julia! Love the cool beach chair and cute bunny rabbit! Thanks for the inspiration! You did a fabulous job with this die! Adorable! What an Easter treat - the finish on the chair is so cool, and I love your cute metallic rabbit - really adorable!